Canyons and Waterfalls with included whale watching tour, Lake Mývatn, Akureyri and Hraunfossar! This tour takes you to the wild landscape of North East Iceland including Ásbyrgi, Dettifoss and Jökulsárgljúfur Nationalpark. Ride on perfect tölting trails across high mountain plateaus with endless views from the higland to the Atlantic ocean. 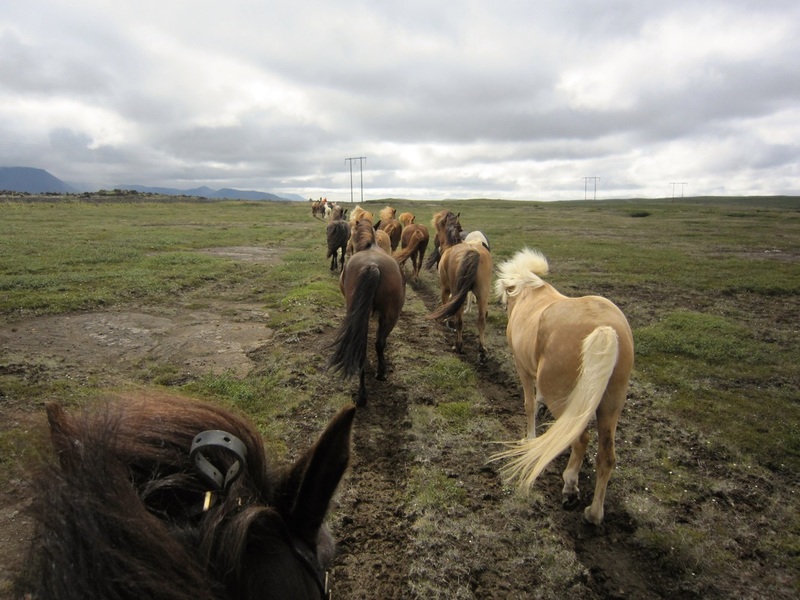 This tour takes us along the most breathtaking paths along Jökulsárgljúfur canyon on tracks only accessible to horses. We will cross rivers, ride across deserts, rest on endless green meadows and visit geothermal fields with boiling mud holes! At Grenjaðarstaðir Heritage Museum we move back in time and enjoy almost every evening a bath in a geothermal hot tub or pool! 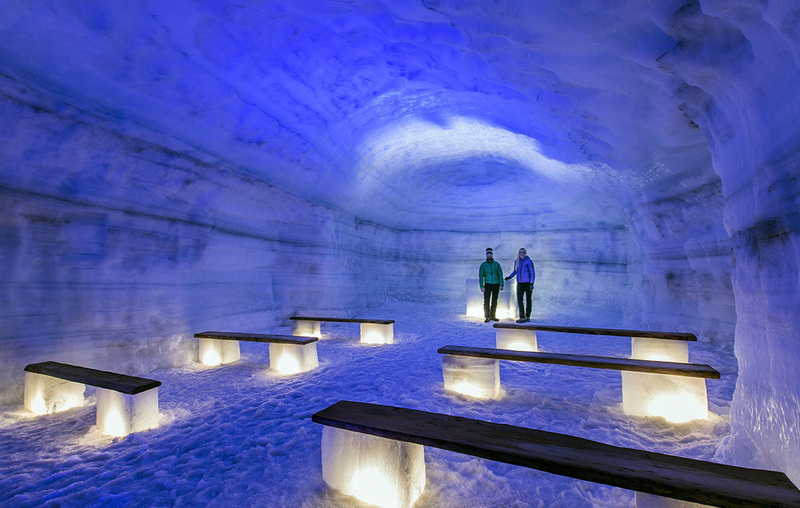 At the end of the riding tour we take you by bus for an exciting tour around Lake Mývatn with its natural wonders such as Dimmuborgir lava field and Skútustaðir pseudo craters, Goðafoss waterfall and the wonderful Mývatn Nature baths! We go whale watching from Húsavík Harbour (included) and stay overnight in the beautiful town of Akureyri with its lovely botanical garden, cozy street cafés and wonderful harbour area. 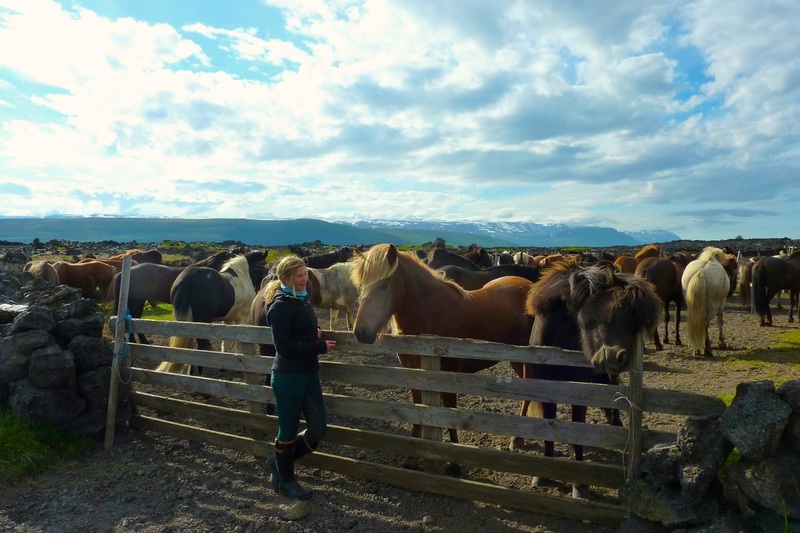 Next day we go along the Ringroad through Borgarfjörður – West Iceland and visit the beautiful Hraunfossar Waterfalls and Deildartunguhver hot spring and a famous horse breeding farm. Truly a wonderful trip to remember! 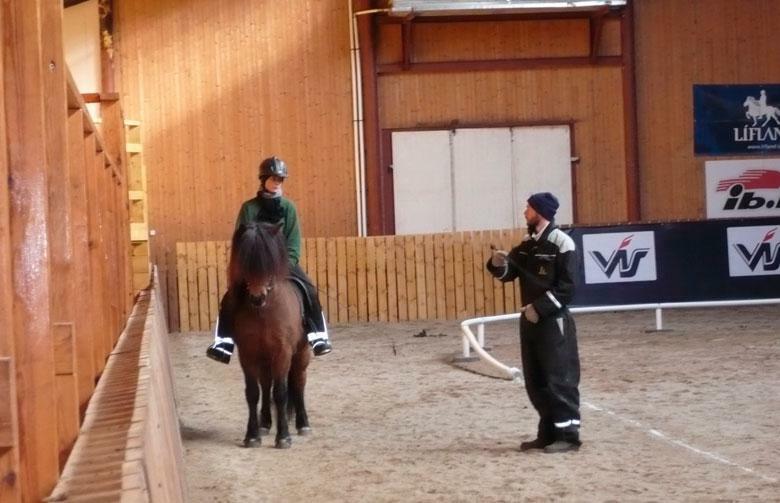 Level of expertise required: Only experienced riders in good physical shape. Accommodation: 4 nights in 2-4 bed rooms in made up beds with shared facilities. 2 nights in sleeping bag accommodation in rustic mountain hut and community center. Accommodation in Reykjavik not included but can be arranged. Meals: Full pension starting with lunch on the first day and ending with picnic lunch on the 6th day. On day 7 only breakfast. Included: Whale watching & Guided Mývatn & Akureyri Tour, Swimming pool Heiðabær with hot tubs and Grenjaðarstaðar Heritage Museum, visit to horse breeding farm. 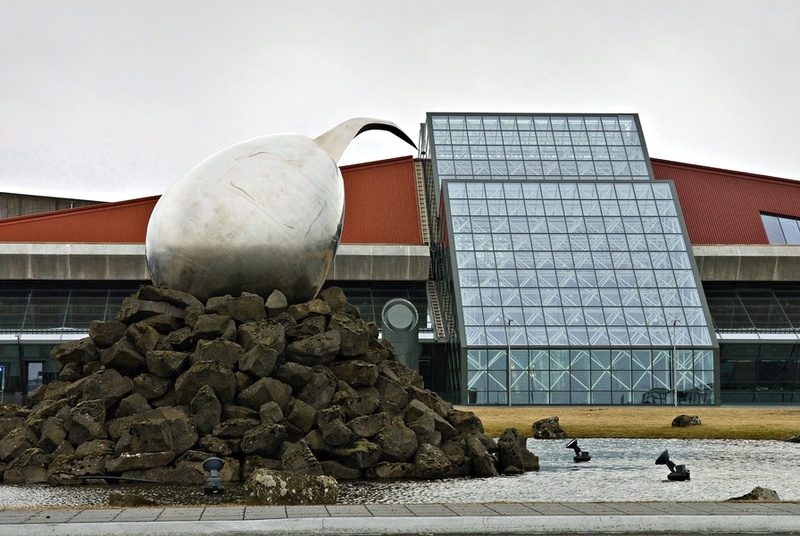 Entrance to Mývatn Nature baths. Guide: English speaking guide. Other languages may be on offer upon request. Meet & Greet with your guide early in the morning at the Eagle Air Gate (next to Icelandair Hotel Natura) for your flight to Húsavík town. 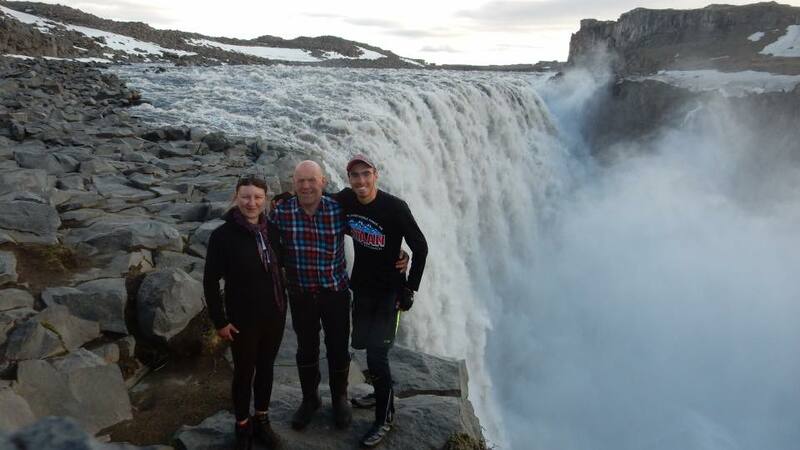 On the way to our starting point of the ride we visit Dettifoss, Europe´s most powerful waterfall and Ásbyrgi, a wide, horseshoe-shaped canyon with sheer cliff faces up to 100 m high. At its innermost end lies Botnstjörn, a small pond surrounded by romantic birch forest and distinctive rock formations. There is also a wonderful mixture of birdlife, with Arctic Fulmar nesting on the steep cliffs, whereas many other birds such as passerines prefer the woods and meadows. Ásbyrgi was formed by catastrophic floods caused by glacial bursts from the northern part of the Vatnajökull ice cap some thousand years ago. However according to Nordic mythology, Ásbyrgi is the hoofprint of Sleipnir, the Norse god Odin's eight-legged horse, left behind as the god rode by! 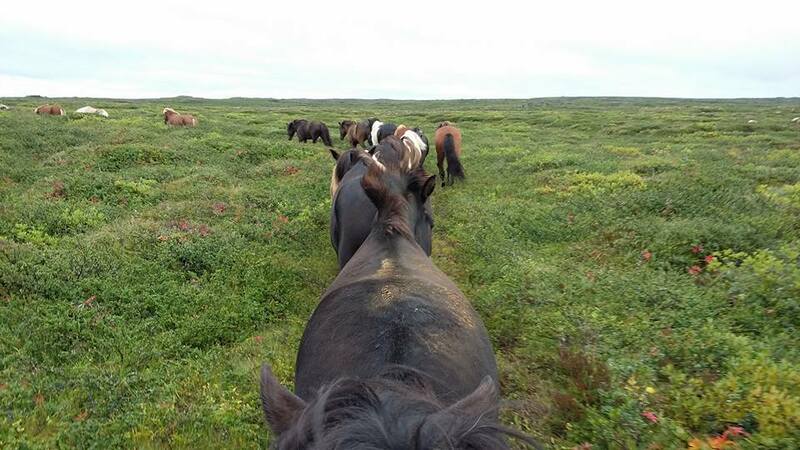 While enjoying a light lunch your guide will give you a thorough introduction to the route, the Icelandic Horse, our tack and the special gait tölt. Off we go on horseback for our first ride on the east side of the National Park Jökulsárgljúfur and visit places like Gloppa, Hallhöfðaskógur overlooking Hljóðaklettar and many more. Today we will be travelling on paths accessible only to horses with breathtaking views across canyons and mysterious lavaformations. Endless nature and rugged wilderness awaiting us! Accommodation Bjarnastaðir: made up beds in 2-4 bed rooms with shared facilities. Hot tub on site. Now we are all set for our long first day from Kelduhverfi in Öxarfjörður Fjord over the highland plateaus of Bláskógaheiði and Reykjaheiði to Skógahlíð. Today we will ride on soft, narrow paths through wild countryside with superb views in all directions. To the south Þeistaeykjabungan and Lambafjöll Mountain range greet us. To the north we can see Grísatungufjöll – the „piglet´s tongue mountains“. Here we are alone with nature – far from traffic and noise. It is only us, our horses and endless space to breathe and RIDE until the horizont! 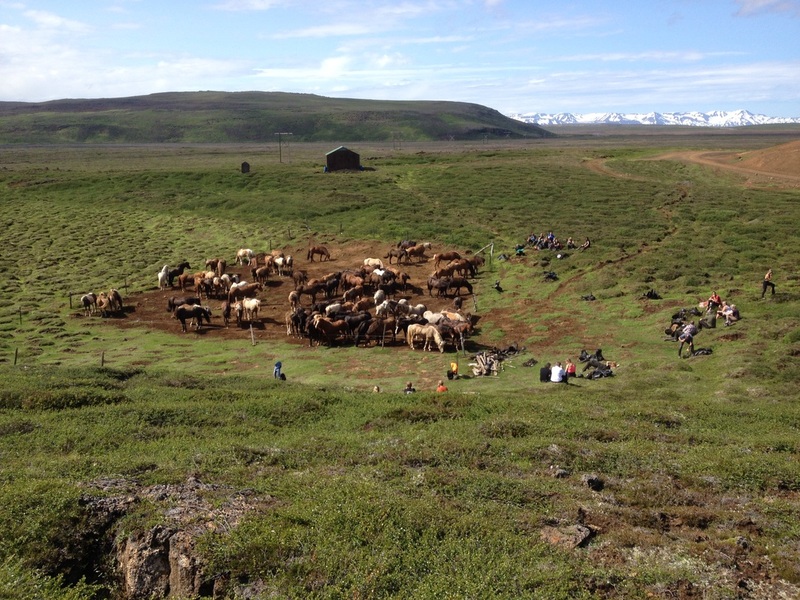 In the morning we rejoin our horses and ride across river Mýrarvkísl and over the Hvammsheiði plateau to the beautiful historic sheep coral Hraunsrétt. The 170 years old sheep paddock is made of lava stones, build by hand by the local farming community and still used by the farmers in autumn to sort the sheep after they have spend the summer up in the highlands. From Hvammsheiðin we can look all over Aðaldalur valley and all the way to the mighty Öxarfjörður Fjord! A more scenic route is surely hard to find! At Hraunsrétt coral Ella will wait for us with hot chocolate and a lovely picknick lunch before we head over the famous Salmon river Láxá í Aðaldal to Halldórsstaðir, where we keep the horses overnight. On our way to our accomodation at Heiðabær we stop at Grenjaðarstaðir. The picturesque turf house used to be one of the area’s chief farms and became the site of a church and a parsonage. It now houses an interesting local heritage museum with nearly two thousand objects. To wander through and imagine how life once was will provide a unique experience. At Heiðarbær community center we will enjoy a hearty meal and relax in the wonderful geothermal water of the swimmingpool and hot tubs... could life be any better? Accommodation Heiðabær Community center: sleeping bag accommodation with swimming pool and hot tubs. From Halldórsstaðir we ride in the morning through the beautiful Laxárdalur valley, crossing Láxá river again. Look out for the salmon – this is after all one of Iceland´s best salmon rivers! We ride up to the plateau of Kasthvammsheiði upland towards Gæsafjöll (882 m) where we stop for our picknick lunch in beautiful wilderness setting! From here we head north towards Bæjarfjall mountain to Þeistareykir geothermal area, with colorful mud pits, earthquake fissures and lava fields. Here you will find the earth constantly at work since we are practically on top of the midatlantic ridge. We stay a Þeistareykir, a true mountain home as remote as anyone could wish for - The hut stands on the grounds of the abandonded farm of Þeistareykir at 344 m.a.s.l. whose last inhabitants moved in 1874. Accommodation Þeistareykir: Sleepingbag accommodation in rustic mountain hut, outside water wc/no showers. From Þeistareykir we ride due north on wonderful lonely riding tracks across Blákskógaheiði towards Kelduhverfi where we started our ride! Today we finish our circle around the beautiful and breathtaking wilderness of Iceland´s North east! After a long day in the saddle we say goodbye to our wonderful four -legged companions and head for a last farewell meal to Bjarnastaðir farm! Riding distance: ca. 38 km. After breakfast return to Húsavík for an exciting Whale watching tour (included) and a visit to the natural wonders of Lake Mývatn such as Dimmuborgir and Skútustaðir pseudocraters. In the afternoon we take a wonderfully relaxing bath in the milky green water of the Mývatn Nature baths. We continue via Goðafoss to Akureyri, the beautiful town in the north of Iceland for an overnight stay. Truly a day full of highlights! (Dinner individually at Akureyri). We recommend an evening stroll through this charming city with its splendid harbour area, its cozy street cafés and Botanical Garden. Day 7: Sunday Akureyri – Ringroad – Borgarfjörður – Hraunfossar – Deildartunguhver – Horse Breeding farm – Reykjavík. After a hearty breakfast at the hotel we set off by bus along the Ringroad passing places like the famous Icelandic Horse county of Skagafjörður and visiting the beautiful Borgarfjörður with its incredible Hraunfossar waterfalls and Europe´s most productive hot spring Deildartunguhver. We will visit a famous horse breeding farm during the day. In the afternoon return to Reykjavík. 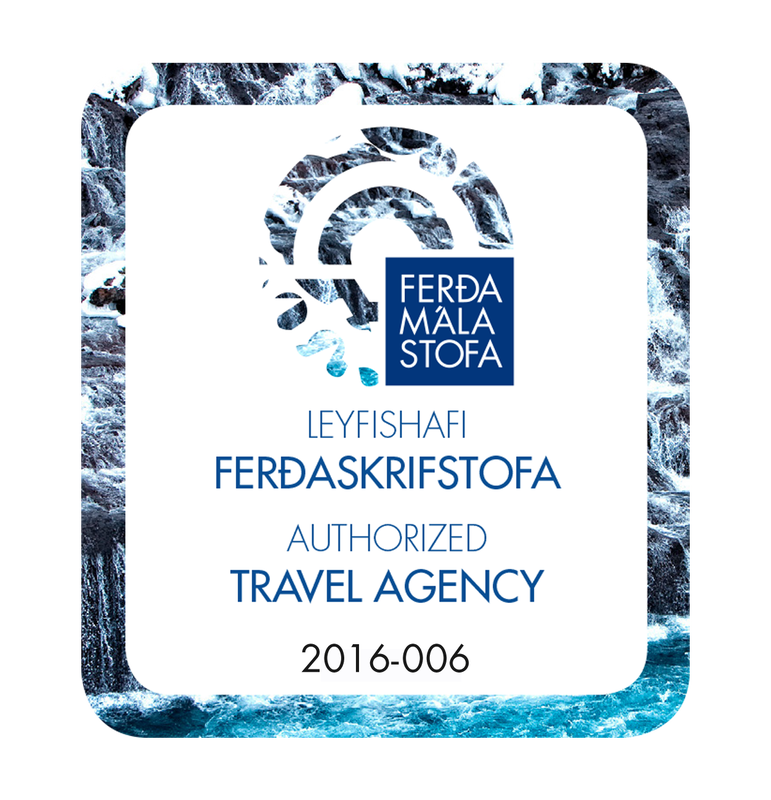 We are more than happy to arrange your Reykjavík accommodation for you! (Lunch and dinner individually). One way flight from Domestic Airport Reykjavík to Húsavík on the first day. 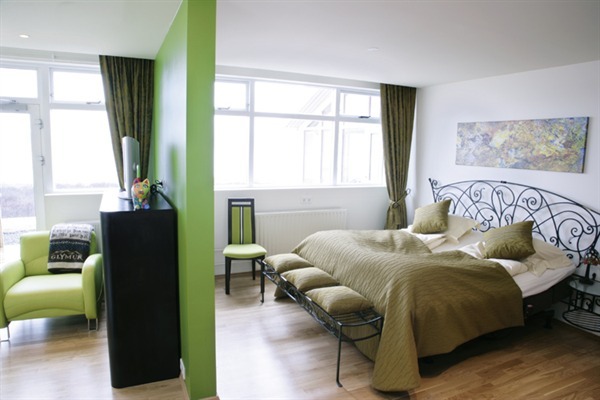 4 nights in made up beds in 2-4 bed rooms with shared facilities. 2 nights in sleeping bag accommodation during the tour. Full pension starting with lunch on the first day and ending with picnic lunch on the 6th day. On day 7 only breakfast. 5 x riding days according to program above. English speaking guide. Other languages may be on offer upon request.